In August of 1995, a film managed to break the curse of previous video game adaptations and actually end up number one at the box office. 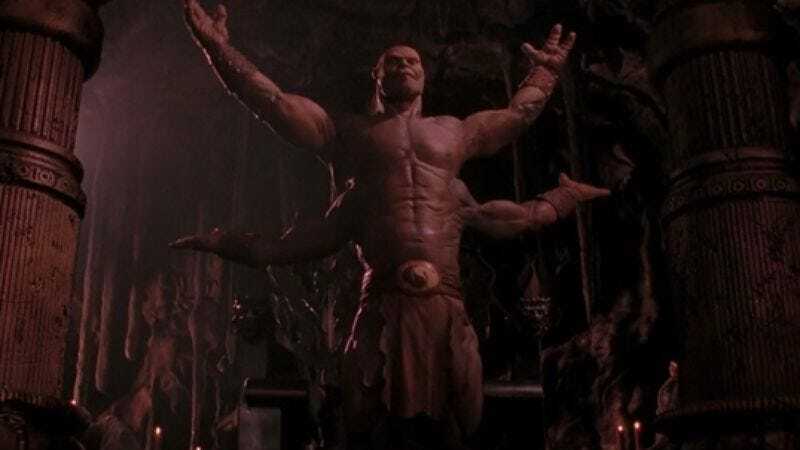 Despite previous efforts like Super Mario Bros., Double Dragon, and Street Fighter, it was Mortal Kombat that finally proved video games were a viable source for adaptation, and a lucrative one at that. Aaron Couch of The Hollywood Reporter recently sat down with many of the principles of the film and put together an oral history to celebrate its twentieth anniversary. What he found was a film where the fighting wasn’t just happening on-screen, but behind the scenes as well. I never thought we were making a movie based on the video game. I always thought what we had to do was imply that the video game is the first incarnation of some story that exists sort of one up the pyramid. I always thought there’s a story that exists, and the first incarnation of that story was the video game. Now let’s go back to that story well and see how we can craft a movie from that. It doesn’t contradict the video game, it adds to it. The oral history discusses the various casting choices that almost were, like Sean Connery for Raiden, and Cameron Diaz, who actually was Sonya Blade until she broke her wrist in rehearsal. Couch also covers the grueling fight scenes that led to Bridgette Wilson-Sampras (Sonya Blade) dislocating her shoulder, Robin Shou (Liu Kang) breaking three ribs, and Linden Ashby (Johnny Cage) ending up peeing blood from getting kicked in the kidneys too hard. So what is the legacy of Mortal Kombat? It launched Paul W.S. Anderson’s career, for good or ill—and according to him, it was also the first time that Hong Kong wire-fu was really incorporated into a Western film. If you look back at Mortal Kombat, it was the first time those big, Chinese wire gags were used in a Western movie. Obviously The Matrix did that to the nth degree several years later. But at the time, Mortal Kombat was very cutting-edge.